Those readers who are familiar with the Cimarron, or know about the thirty-two other "T3" oilers that followed her down the ways, will be surprised to learn that this famous vessel was originally built for the Standard Oil Company of New Jersey--a little-known fact that has a large bearing on our story. How this came to pass involves Adm. Emory S. Land and the establishment of the U.S. Maritime Commission's long-range building program. In July 1918, Land was temporarily transferred to London to the staff of Adm. William S. Sims, commander of all U.S. naval forces in Europe.16 While serving on Sims's staff, Land was involved in a number of sensitive missions "performed under the direction of the chief of naval operations. "17 These duties involved inspection trips to gather technical information on enemy submarines, and most remarkably for a naval constructor, direct involvement in the negotiations for the Austrian armistice. To be selected for such sensitive duty he must have been held in high esteem by his superiors. Land was later awarded the Navy Cross "for distinguished service" for this activity and his work in the war zone.18 The commendation and the date of the citation (20 August 1919) lead one to believe that it may have been issued in part as an incentive to keep Land, who was already considered a highly talented officer, from leaving the navy for greener pastures after World War I. Bureau of Aeronautics (BuAer). Land now considered himself a staff officer and was clearly seeking further opportunities for advancement. He was certainly aware of the discussions on naval disarmament then taking place during the Washington Naval Conference of 1921-22, and was probably concerned about its effects on his career as a naval constructor. These talks did not bode well for the Construction Corps, since a freeze on new construction would obviate the need for their services. Evidently, Land recognized the possibilities offered by the new bureau--the first to be added since the Civil War--and decided that it provided him with the best chance to achieve further promotion within the Navy Department. returned to the navy is unclear, but the country was in the depths of the Great Depression and there were few jobs to be had. While serving in the CNO's office, Land continued to cultivate the patronage of important personages including Secretary of the Navy Charles F. Adams and his assistant Theodore "Teddy" Robinson, another member of the Roosevelt clan and a close social friend of the Lands.26 Both men recommended that Land be appointed as the next chief of the Bureau of Construction and Repair, a billet that would automatically promote him to the temporary rank of rear admiral. President Hoover nominated Land for the post in September 1932, just before the elections that swept Franklin D. Roosevelt into office. worked efficaciously to get warships included in the definition of the NIRA's provision for public works (see chapter 4). On the day before the NIRA was to be passed, Land, in company with Admiral Pratt (CNO) and Rear Adm. Samuel Robinson (chief of BuEng) flew to President Roosevelt's home in Hyde Park, New York, to present an estimate of the bureau's (C&R) recommended shipbuilding program to include in the new bill as a public works measure. Together they drafted Executive Order 6174 allocating $238 million for naval construction for inclusion under the provisions of the Public Works Administration section of the bill. Roosevelt signed the order in advance so that when the NIRA became law, it automatically provided funding to build thirty-two ships for the navy--the first major shipbuilding program since 1916!30 The political acumen demonstrated by Rear Admiral Land during his first months as chief constructor did not go unnoticed by Roosevelt who would later appoint Land to the U.S. Maritime Commission. In the interim, Admiral Land would supervise the rebirth of the Bureau of Construction and Repair, which had languished during the inactivity of the 1920s, and would help Standley assure passage of the Vinson-Trammel Bill for even more ships. During Land's tenure at the Bureau of Construction and Repair, he presided over the largest peacetime building program ever undertaken by the U.S. Navy up to that time. In the four years he served as chief constructor, the navy laid down 106 new warships: 2 aircraft carriers, 8 heavy cruisers, 9 light cruisers, 65 destroyers, and 22 submarines. While supervising the construction of these vessels, Land laid the design foundations for the huge prewar building program that would follow in his wake. Jerry Land was an active member of the Society of Naval and Marine Engineers during this period of time and was even elected its president. Kennedy was the "Boss" when it came to matters of organization policy and, according to Land, "generally carried the votes of at least three of the five commissioners in his hip pocket. "33 As there was no vice-chairman, Kennedy always designated Land as acting chairman when he was away, which was often. Board meetings were regarded as a nuisance by Kennedy and he frequently cast the deciding vote by telephone to Land's office where at least half the meetings were held during Kennedy's chairmanship. The two men frequently lunched together in a separate room set aside for the chairman, his executive director, and his general counsel. Working closely with Kennedy provided Land with a liberal education in politics. Kennedy jumped on the bandwagon, though it was clear to both men that a program of that size would have to be implemented in several stages. In August, Kennedy submitted to Congress the first of the commission's programs for constructing merchant ships under the provisions of the Merchant Marine Act of 1936. As outlined by Kennedy, the commission would construct ninety-five ships at a cost of $256 million (see table 8) over a period of eighteen months to three years.37 Included in the program were ten tankers of an unidentified type costing $28.5 million. no effort was made by the Navy Department to find out whether or not any or all of their special requirements could be incorporated in the tankers under consideration by the Maritime Commission. for other duties," an important consideration during this period of budget cuts and economy measures. On 25 August, the House passed the Third Deficiency Appropriation Act. Although this bill did approve some funds for constructing the auxiliaries previously authorized, it restricted the amount to that required for only two vessels: the destroyer tender Dixie (AD-14) and the seaplane tender Curtiss (AV-4).49 For the time being, the navy would have to make do with its existing fleet of aging tankers. Negotiations between the maritime commission and various oil companies for the construction of high-speed tankers continued throughout the fall. Tentative plans had been reached with the Standard Oil Company of New Jersey to build ten high-speed tankers with the government paying the cost of the larger engines needed for increased speed. By the first week in December, Standard Oil had solicited and received bids from a number of yards providing for the construction of a number of 16,300-ton (deadweight) capacity tankers. Bids were requested for two versions: a single-screw design of 13 knots and a twin-screw design of 18 knots. The price difference between the two would be used to establish the government's cost subsidy for greater speed. Plans and specifications for both designs were prepared for Standard Oil by naval architect E. L. Stewart.50 It seems certain that the design for the 18-knot tanker (Standard Oil Co. of New Jersey Design No. 652 NDF) evolved out of the bureau's (C&R) design for a fleet oiler.51 Preliminary plans for this purpose had already been prepared by the Bureau of Construction and Repair in accordance with Standley's previous directive, and it can be readily assumed that Land could have easily arranged to have this information passed to Hague or his company. The high-speed tankers proposed by Standard Oil would be considerably faster than any similar vessels previously built in the United States. The desired characteristics of these ships were later specified by the maritime commission (see table 9). SOURCE: "Maritime Commission Working on Enlarged Program for Fast Tankers," ME& SR, January 1938, 47.
was not the only American ship struck. Three other vessels, the Mei Ping, Mei Hsia, and Mei An, were also sunk. All three were owned by the Standard-Vacuum Oil Company, a joint venture between Standard Oil of New Jersey and The Socony-Vacuum Oil Company.53 They were operated by Socony as part of a small fleet of river boats engaged in the kerosene trade. While the Panay incident is a well-known event, its influence on the commission's tanker program and the navy's procurement of fleet oilers has not previously been identified. Before this incident, the maritime commission was having a difficult time getting any of the oil companies to agree to purchase the fast tankers that it hoped to subsidize. The sinking of these vessels probably helped convince both Standard Oil and the Commerce Committee of the need to participate in the commission's program. Standard Oil would have exclusive control and supervision of the construction, but no changes were to be made in the plans and specifications without the written approval of the Navy Department and the maritime commission. to the navy in time of national emergency and quickly converted to fleet oilers. At the time, the Navy Department considered a speed of 161/2 knots sufficient for tankers to accompany the fleet. Since this was faster than any tankship previously built in the United States, the commission developed a radically new tanker design based on the engineering requirements provided by the navy from its earlier testing at the model basin. in the designs submitted by each yard during the bidding process actually contained higher values for the estimated power, ranging from a low of 12,600 s.h.p. (Bethlehem) to a high of 13,500 s.h.p. (Newport News). This variation is understandable since each yard intended to install its own equipment, but it had led to much confusion concerning the reported shaft horsepower of this class, especially since each yard furnished its own power plant (or that of a favored supplier) in the ships it was to construct. 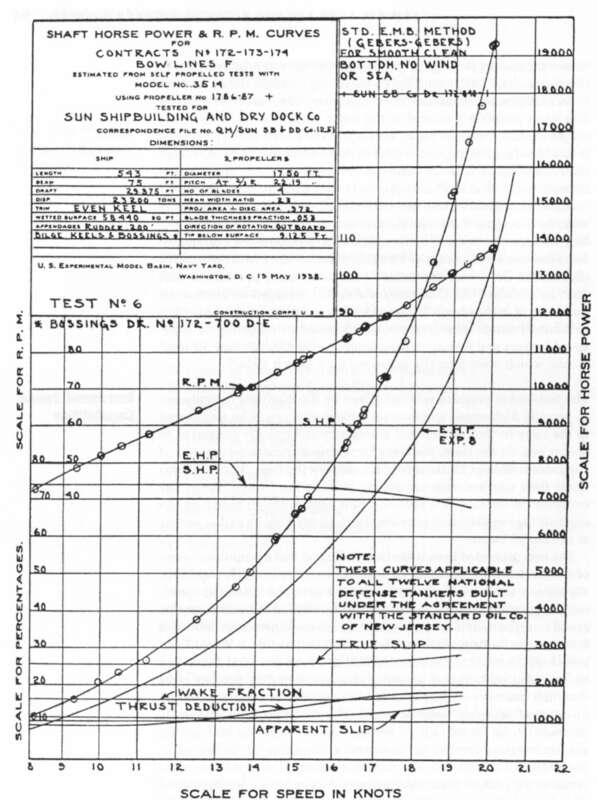 The design changes made by the maritime commission after the first set of specifications had been issued (normal shaft horsepower was raised to 13,500 s.h.p. with a continuous overload capacity of 10 percent) were never publicized.70 It is likely that they would have raised serious questions within Congress as to the actual nature of the vessels being built and the costs involved. Since they were of a highly technical nature, it was easy to keep them within the maritime commission until after the first ship was launched. The high speed intended for these ships (12 to 13 knots was then considered the norm for a tanker) led to the introduction of the term "fast tanker," which was coined to describe these and all subsequent high-speed tankers subsidized by the maritime commission before World War II. The increases in speed and the extraordinary size of the propulsion system (the fastest commercial tankers then being built in the United States had only 5,000 s.h.p.) were obviously made to accommodate the navy's wishes, demonstrating once again the mutual interests shared between the navy and the maritime commission.